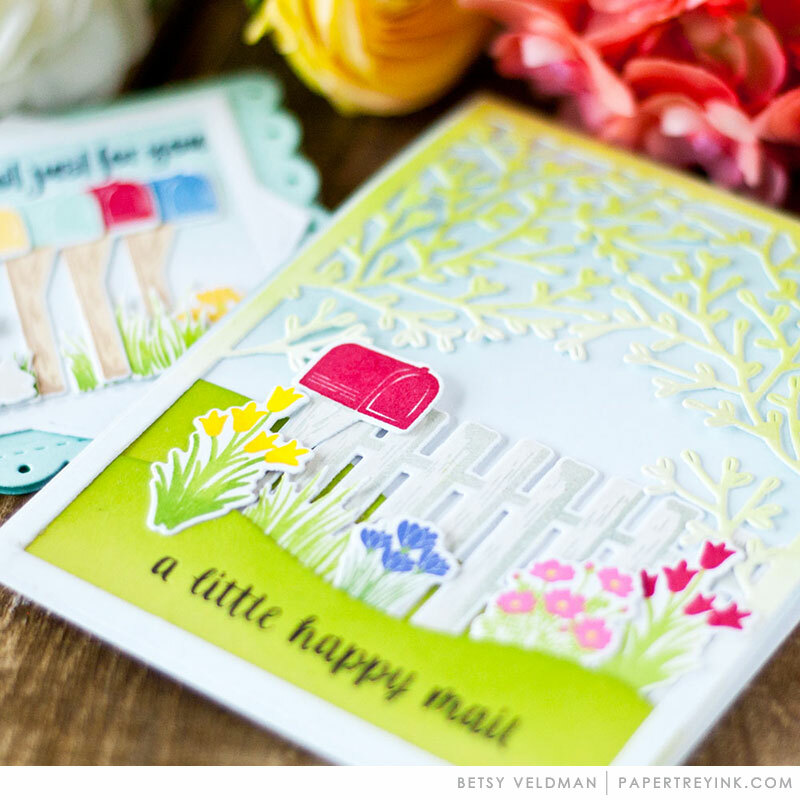 Today Betsy Veldman is ushering us into Spring with her Fence Line: Spring stamp set. This collection of images will have you dreaming of crisp mornings that warm to sunny afternoons, delicate blossoms popping open on fresh green foliage, and mailboxes bursting with letters from friends and loved ones. 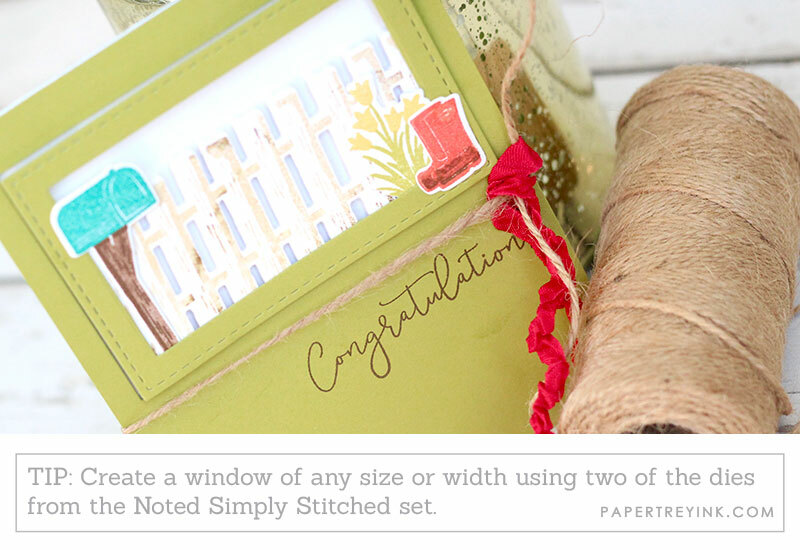 We’re also debuting her newest Noted collection, Noted: Simply Stitched A2 Vertical. This set of nesting dies will make creating layers and frames for your springtime scenes a breeze! 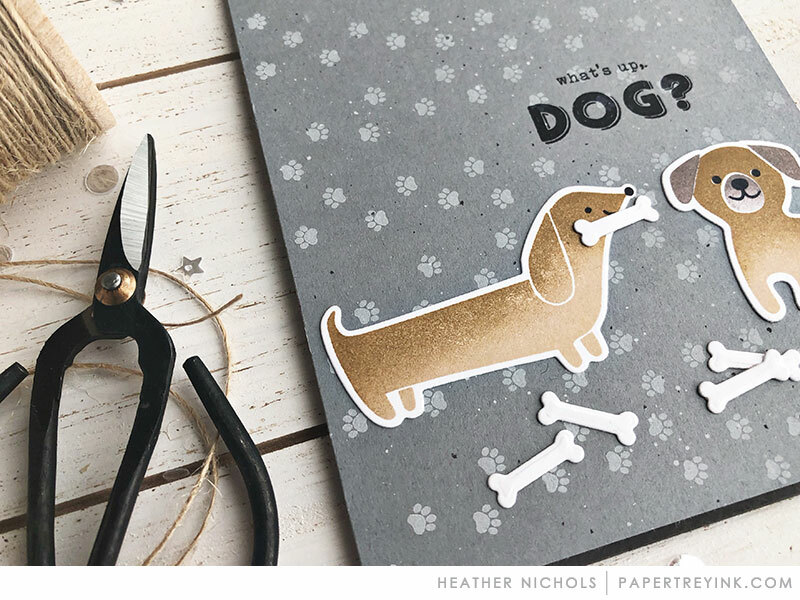 We’re also excited to feature a delightful dog themed collection from Heather Nichols today. You’ve been looking for the perfect, whimsical pups and Heather has you covered! 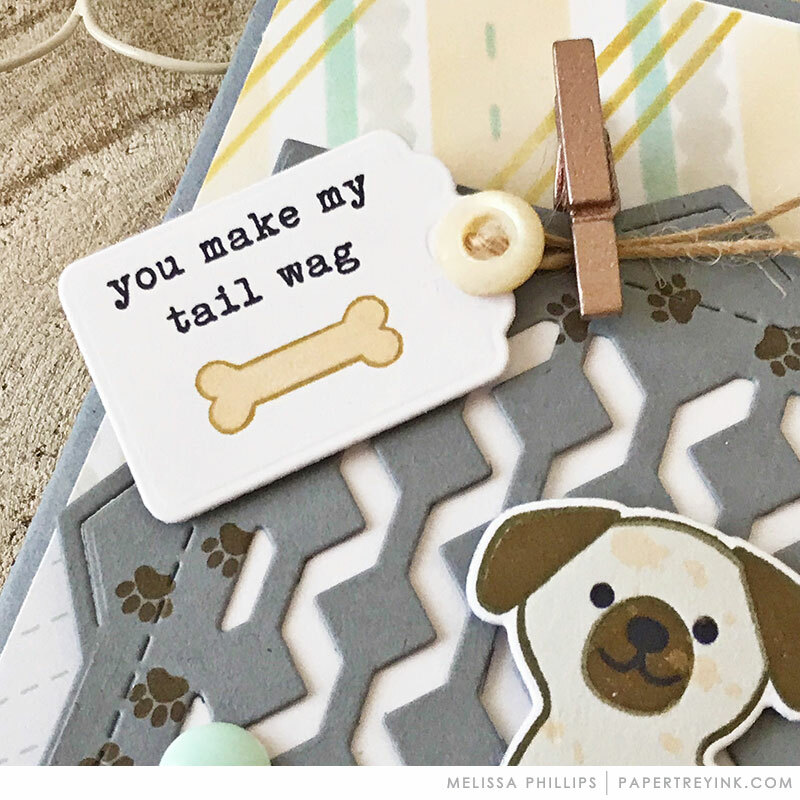 Paws & Kisses and A Bit More: Paws & Kisses offer two adorable dogs and a clever selection of greetings sure to please even the most discerning doggo. This set is a must have for any stamper’s collection! Let’s take a closer look at today’s introductions! 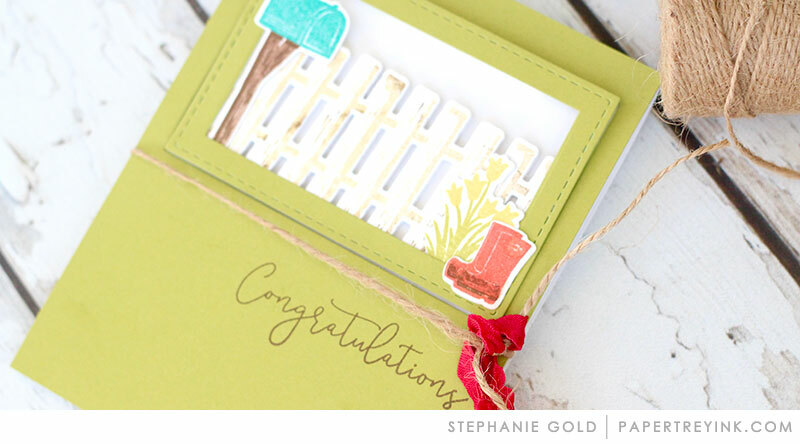 Stephanie Gold is featuring Fence Line: Spring + Noted: Simply Stitched A2 Vertical. 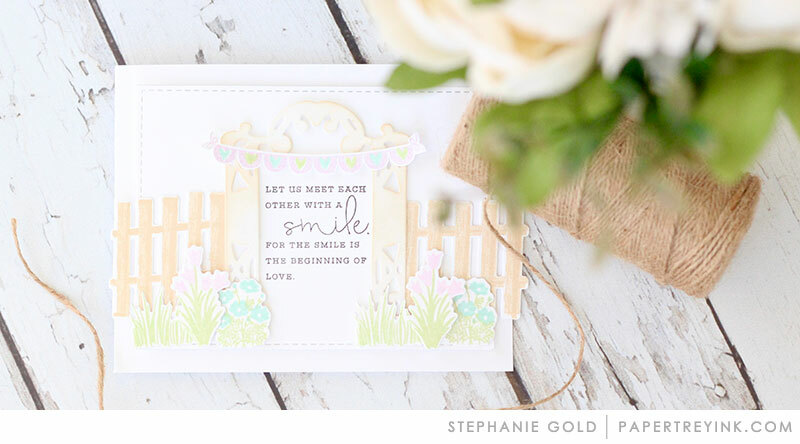 Stephanie’s garden gate scene is so serene! The blooming springtime flowers look lovely lined up against the fence. And she found the perfect die (from Gatsby Glamour) to act as a trellis and decorated it with a petite banner for added softness. Which dies in your collection might work as a clever substitute? By having elements layered both in front of and behind her frame, Stephanie has created depth in her charming scene. She used the die and fence detail together to create a weathered white fence, keeping things nice and light. And the mud on those garden boots? Too cute! Stephanie used large blooms and scallops to soften the straight lines and edges of this card. The inviting pastels also bring a feminine spin to what could be seen as an otherwise traditionally masculine project. 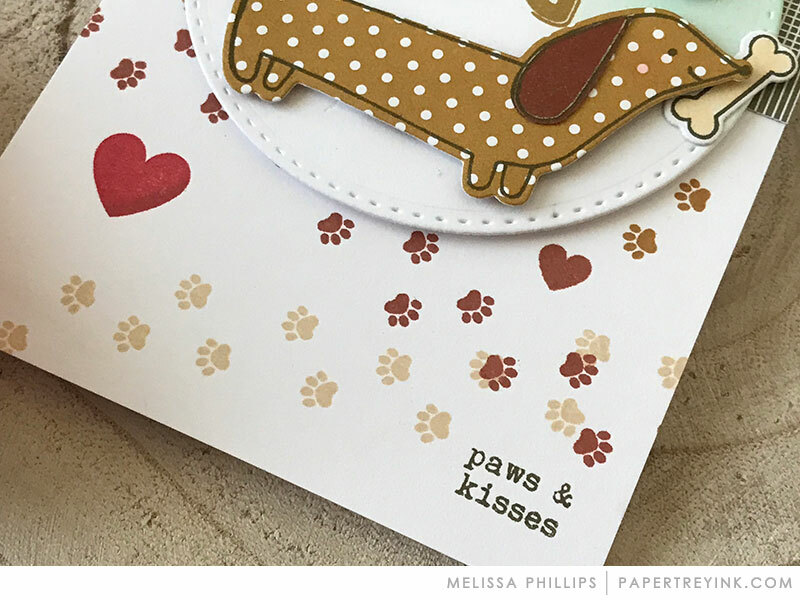 Melissa Phillips is featuring Paws & Kisses + A Bit More: Paws & Kisses. 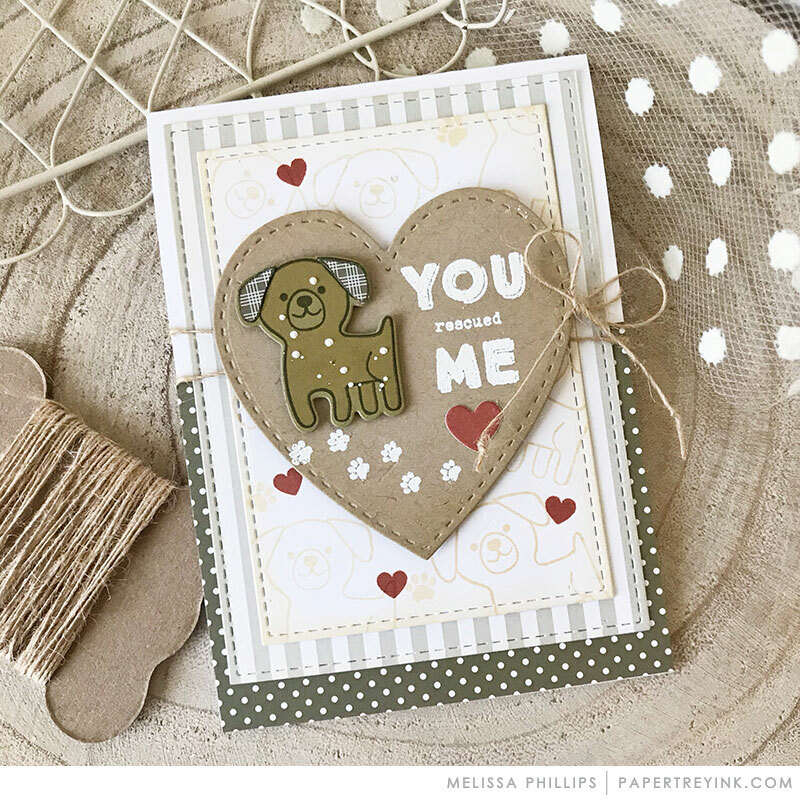 Melissa’s adorable puppy love card is full of pattern, but she used very different scales to keep them from competing and making her card too busy. Her paper pieced pup is just about the cutest thing on legs! Paper piecing is a fantastic way to add color if you’re not comfortable with markers or watercolors. And her snappy pops of red are a great way to brighten up her neutral palette! 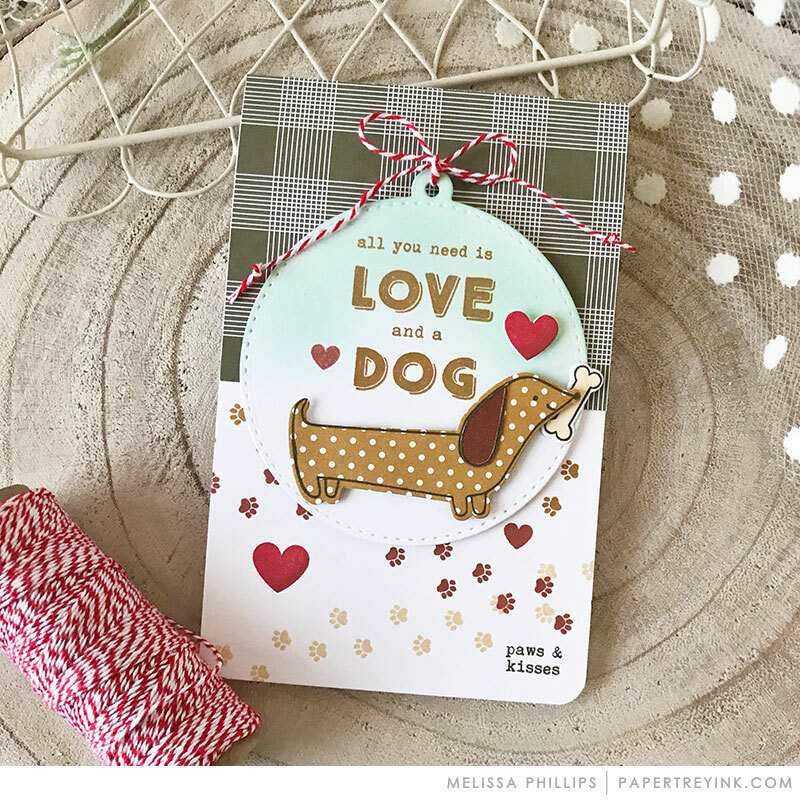 Using a large, heart-shaped die cut like Melissa did on this card is a brilliant way to reinforce the affectionate theme of her project. And creating a patterned layer by using the outlined puppies makes the more detailed “chosen” pup stand out even more. 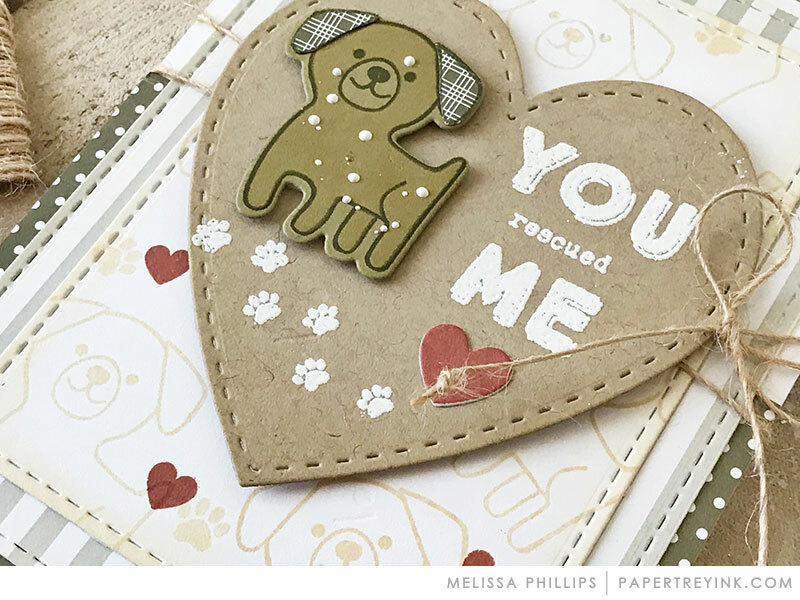 Melissa’s frame of stamped paw prints adds a playful touch to her Shape Shifters: Square 1 die cut. 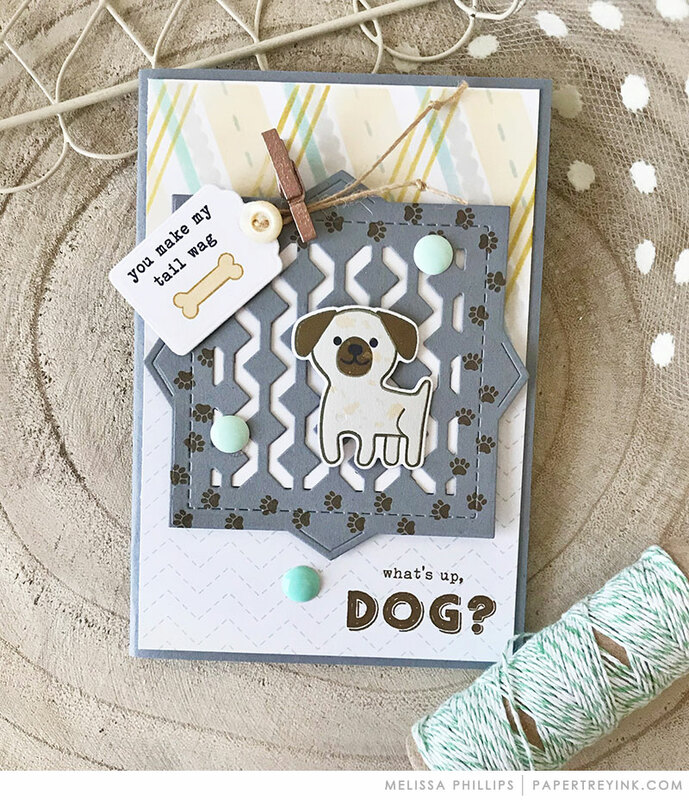 That fun-loving tone works perfectly with the cheeky sentiment and speckled pup! I hope you have enjoyed all the creations that we have shared with you today! Is it beginning to look like spring in your neck of the woods or are you still waiting patiently for your own fence line to bloom? Do you know a dog lover who would appreciate a card featuring one of Heather’s adorable pups? We would love to hear your initial thoughts on everything we introduced! Please leave a comment on this post to tell us what you think of the new products and you will be eligible to win big! You have until 7am ET, Thursday, April 12th to leave your comment and be eligible to win. Only one comment per person please. One randomly selected winner will be announced on our Release Live Broadcast on Papertrey Ink’s Facebook page and posted on the April Release Winners Page on April 15th after the live broadcast. Those puppy dogs are so very cute. Love the polka dot dog. So easy. I predict noted: simply stitched will be the biggest seller of the year! Perfect product. Love the Spring fence! Looking forward to each seasons version! Thanks for the opportunity to win! I’m a sucker for a dog stamp so delighted to see these ones today! Sweet little pups! Love the pretty flowers, and the fence! Such cute doggos! Great designs. Heather! Only day #2 and already so much inspiration and wonderful products. I love the spring fence! So cool! *swoon* The fences….. LOVE!!!!!!! And the pups are so adorable! Love the new stitched dies. Dog gone cuteness going on here. Love it. Cannot wait to see more. The detail on the fence is wonderful! Love all the design team ideas! Can’t wait for the new gray! Paws and Kisses looks so cute! I volunteer at my local humane society, so I’m a sucker for dogs (& cats). Both the fence line and cute puppies are on my list!! Love them both and such cute projects!! Thank you for your inspiration!! These are so cute! I just love the paper piecing on the dogs! Super cute puppies and pretty Spring time fence and flowers! I am loving the “shape shifters”. I also like the dogs and the cute little paw stamp. Paws & Kisses is just precious! and I LOVE the new Bitty Big Honey Nut & Smokey Shadows, by the way! Spring time Fence is adorable, and I love that bunny & rainboots! I think I’d like any card with a mailbox on it! Heather Nichols hit one out of the park with her kraft rendition! I just love the card made by Heather Nichols . The use of craft cardstock along with the picket fence and flowers are just BEAUTIFUL. Soft and stunning . Can’t wait to try this for myself ! Love the bunches of flowers in the fence set! Curious about everything that was shown today. The fence is fabulous! The little paw prints stole my heart. I hope I am as excited about the full reveal. Oh my goodness – you got me today! I love this fence series!!! I love the new stitched dies! Perfect for adding extra details to cards. Woof! I love those doggos! Just adorable Heather! You guys are all amazing!! The dogs are darling. Great to have a fench too. beautiful cards. Such cute pups and I love the fence! Betsy does it again….another fantastic looking set…so lovely. And Heather…those puppies are just the cutest! Loved all the projects today. Cheers. If it has Betsy’s name on it, I’m sure to love it! Love the fence line set so much!! 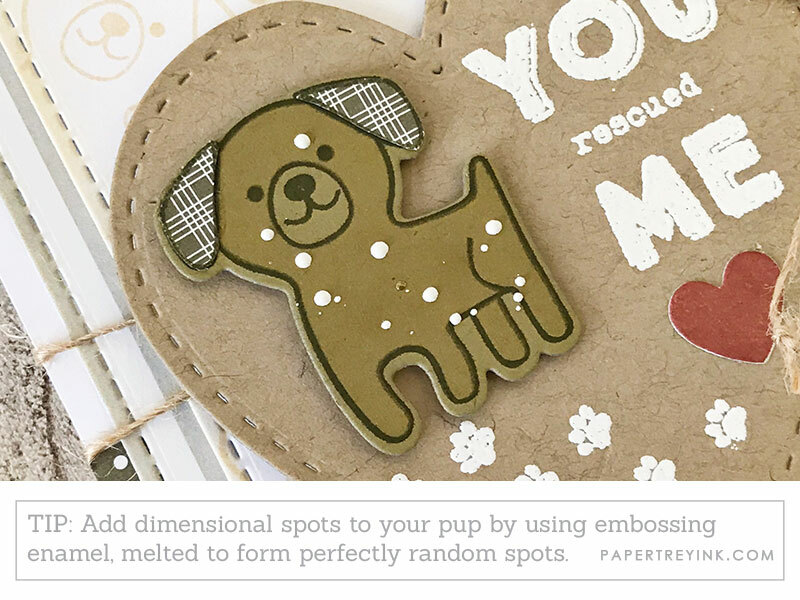 Really fun and fresh ideas from the team today – love the new doggy stamps! It’s those doggie paw prints that had me aaaahing this morning! Can’t wait to play with the new grey! And looks like the fence will be a new staple that goes with anything! Such sweetness today! In real life the dog would be digging up the pretty flowers you’ve planted along your fence haha! Did not think I needed another fence but love the details and the rustic two step design! Such wonderful spring and dog stamps! Fence Line-Spring and Paws and Kisses are both fun additions to the lineup today. Lots of fun samples too. Thanks DT! 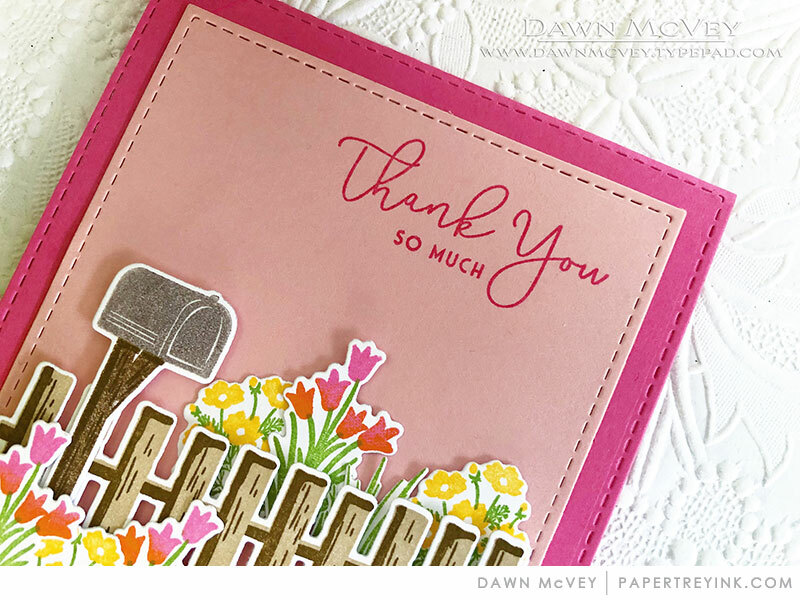 Love the spring fence; all the cards were delightful! And we sure could use a little spring where I live. All the cards today were so cute and creative. Thanks for the chance to win a gift certificate! I really like the fence and what a terrific job the team did showcasing it. the paw prints from the heart; so clever. Loving that tiny pair of rubber boots in Betsy’s new set!! So cute! I’m in love with the new fence series!! The detail is just lovely! And the sentiment is so beautiful 😊 can’t wait to see more! Love the scenes that can be created with the fence, exciteyto see it’s a series! But the pups have my ❤️! Love those adorable dogs & the sentiments are perfect! The fencing is a much needed set also. Beautiful cards, DTs! I’m so excited to see a new Noted die set that can be used on masculine cards. Keep them coming! The dog set is perfect. Oh wow! Love the dog set. So adorable! Betsy’s fence line set is wonderful. 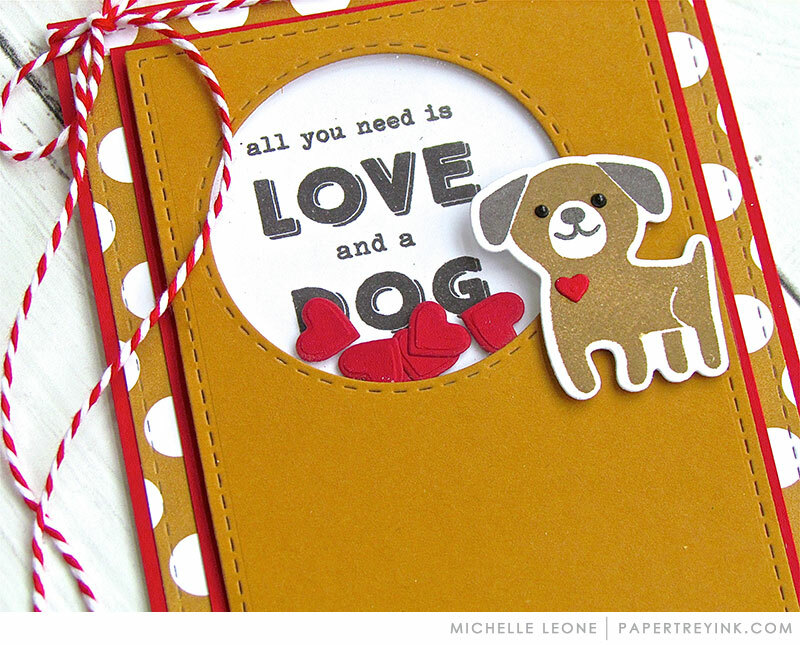 I’m a big fan of Michelle Leone’s cards today! Can’t wait to try out Betsy’s new fence set too! Love the fence and those puppies are adorable! I really like the Fence Line: Spring! I love all those happy cards that were created using this new set! Paw Prints is just adorable! Wonderful projects today. Simply stitched, fence line, and puppy dogs, love them all!! 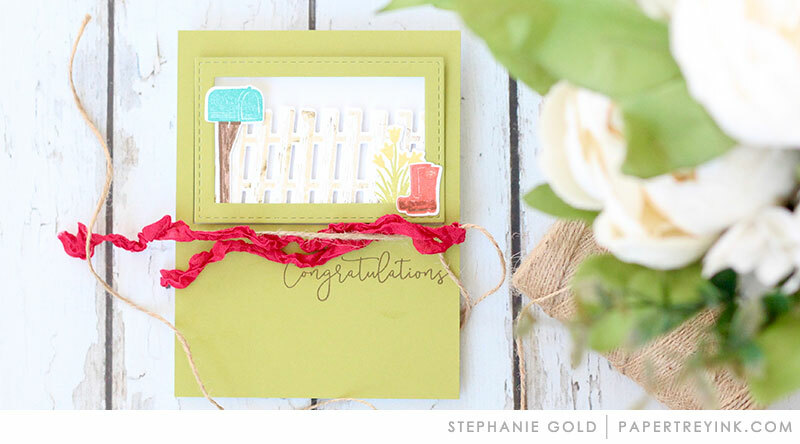 What delightful cards made with the Fence line set! While I loved all the cards made with it, Heather’s scene on Kraft was breath taking! What cute doggies! I’m also “digging” the new Noted dies. I’ve been hoping for something like that. I think the Fence Line spring is so cute. The stitched card dies are long overdue!!! They finish a card so nicely! Aww! I love the puppies, so cute! 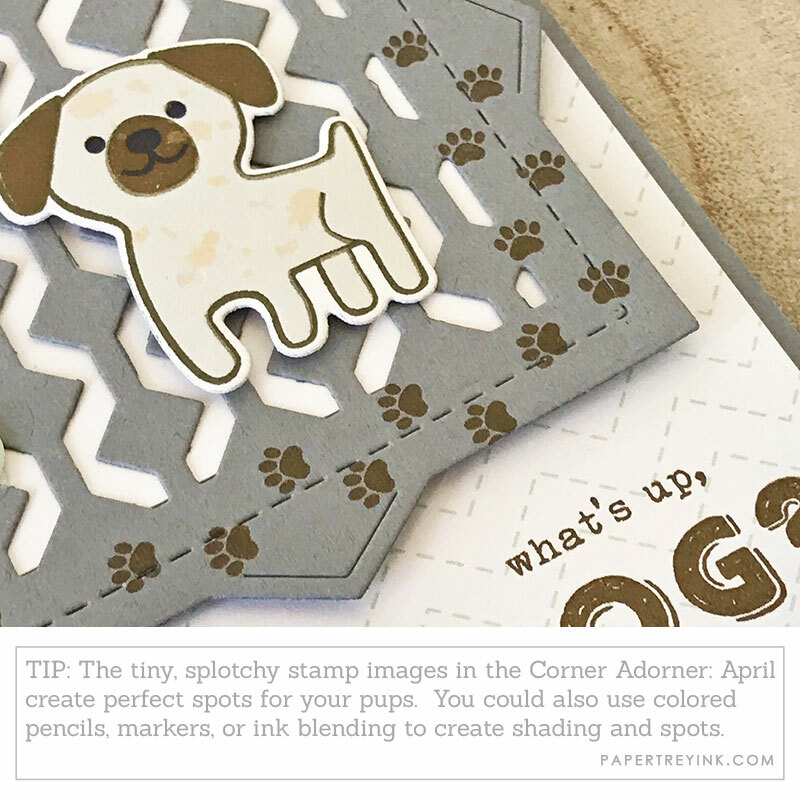 And I love the tip about stamping the pups onto patterned paper for extra appeal, I never think of that! Love all the new products and inspiration projects! I have been looking for some puppy stamps and these are perfect! LOVE the fence and mailbox! Great cards! Paws and Kisses is the way to this pet lover’s heart! The pups are cute. Looking forward to seeing more of the new Shape Shifter. Those Dies – Must Have Those Dies! As always, everything is wonderful, but card making basic dies are my favorites! I am most excited for the new Noted Set. Two delightful new sets! love the fence and all the garden flowers – and the cute pups! You really got me with that fence and mailbox. So cute! Today is wonderful, plenty of goodness! Love the dogs (who doesn’t??) – can’t wait to see the whole set. I love these examples very much. We are a dog family (our five kids have 11 dogs between them), so these doggies are a must! The fence reminds me of Garden Gate and I bet will work beautifully together. I absolutely love those dogs. Love the new Noted: Simply Stitched! The doggies are so cute!!!!! Love the A2 dies! And that fence line is just great. Awesome! Those doggies are just too sweet. Love seeing the Simply Stitched: Vertical dies. I have been wanting a set like these for a long time. And the dogs are adorable! Aww, what fun new products and darling inspiration. Oh my the dog sets! Cute puppies, and I really love the fence! Love the mailbox and boots with the fence, so perfect for so many themes! I’m already thinking how to use those cute dogs and that great fence, together. Love everything today! The Fence Line:Spring products are on my must-have list! I love that they coordinate with so many other products to help build the background and they’re beautiful. Plus the A2 stitching dies are must-haves, too. And those dogs are adorable! Oh my gosh, those dog sentiments are perfect. I can’t wait to add them to my growing supplies of dog stamps and dies. The sentiments are very unique and I appreciate that they are different. Uber cute products. 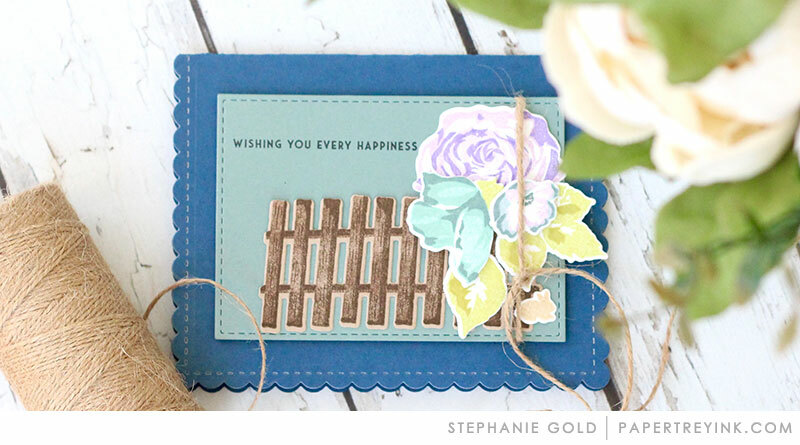 Love all the possibilities with “along the fence line’ suite. As a dog-lover, I am so happy to see the cute dog stamps and sentiments. In fact, everything showcased today is purchase-worthy!! Love the new fence line by Betsy! Can’t wait to see the rest of them too. The puppies are adorable. Great colors, texture and designs. And that fence line is amazing. I love all the flowers and ideas. Another great release. Thanks for the inspiration! 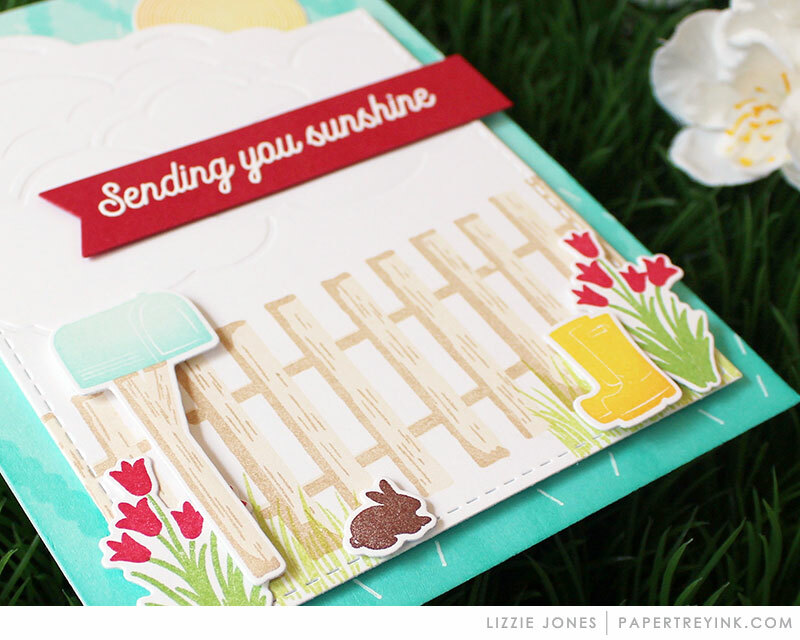 Love fence line it is great, and know you will be adding fun additions for the other seasons! Anything with dogs is also a must have! Oh my! How adorable is Paws & Kisses!! Already thinking of friends I would love to make projects for from this set! Such cute ideas today. The new fence set and doggies are winners! Lovin that fence line. My wheels are turning on how I’m going to use it. The spring fence set is adorable! Love love love! Great cards and stamps! 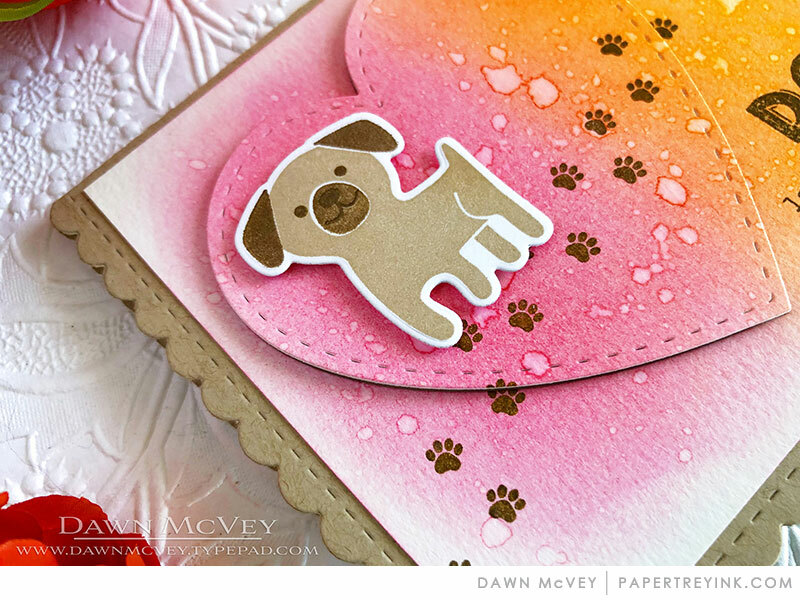 Love the idea of putting the little hearts in a shaker on the cute dog card. It’s so fun to see all the different ways y’all are using these sets! All the cards made with them are so pretty! And no spring here yet, but it was above freezing yesterday, so some of the snow melted. The forecast is to snow the rest of the week here. Getting a little impatience. But the happy spring flower cards make my heart sing. Really like the fence and the flowers. I needed a good fence die and I like the layers on it and that it comes with a die. Yah! And who can resist those cute dogs! I hope that Fence Line will be a seasonal series. I really love what the team has done with it. And…the weenie dog!!!! Love. What is there not to like!?! We have dogs but I don’t usually do animal cards but maybe now. Great release so far,can’t wait for the remaining days of looks. The Fence set is so lovely! What an out-of-the-box floral set! And those doggies are adorable! I love all of the cards today. Being a big doggy lover I’m immediately drawn to the darling pups! Such inspiring projects by the DT–great new products! The dog cards are so cute and I love the new fence line set. ‘Can’t wait for tomorrow. I can’t wait to get the Fence Line: Spring set. Maybe it could be used with the Garden Variety stamp set and a seed packet die. 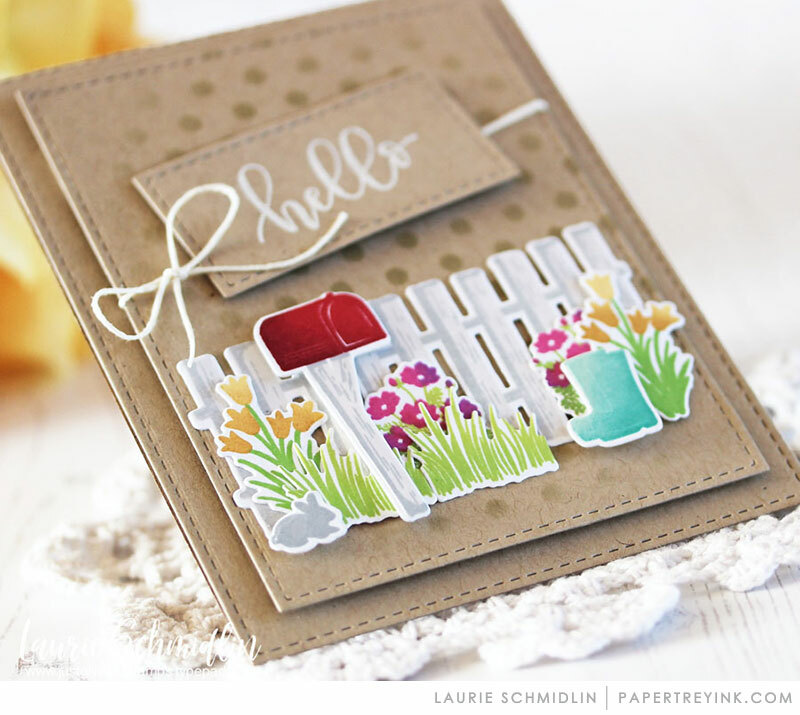 the fence line spring is so pretty, has so many different stamps to use, love it! I loved seeing so many of the cute dogs today cut from patterned paper. Such a cute set! The fence is so fun. Dogs rule the world, so love those, too!!! The dogs are so cute! Perfect for every dog lover in your life. The boots that go with the fence set are cute. The new A2 dies are just what I have been waiting for, The dogs are adorable and the fence line stamp set is too cute. Sweet, sweet dogs! The fence is so pretty with the flowers and mailbox. I’m very excited to see the A2 dies, too! Keep spotting that new shade of gray…lovely. Another fun day of new stuff – you do know that I’m beginning to look like a PTI warehouse. I Love everything today!!! The fence, dogs, and dies- oh my!! I want it all!! Love all the details with the fence and scene and the dog set is just so cute!! Spring is starting to bloom as snow is the in forecast this week. Loved seeing the dreamy spring cards. Beautiful! I also know several dog lovers who would be over the moon for cards featuring those fun stamps. I especially like Heather’s ethereal card using Fence Line: Spring. Is the name a hint that other seasons will follow? The fence line is so sweet and those dogs….. Adorable!! Super cute dog theme and fence products. super cute projects from everyone! Bring on Spring and love the cute doggies. Awww!!! I’m in love toaday for all these stunning new goodies! In particular way because I’m a big dog lover and I need this new stamp set! Paws & Kisses is too cute! I love also Fence Line Spring set!!! I love that more cute dog stamps are coming out – kinda tired of cat stamps! WOW what an awesome new release!! I love the dogs and the fence scenes. I LOVE the new doggie items!! I love both the Fence Line: Spring and Paws and Kisses! Fabulous cards today!! I’m another one stalking that new gray. The more I see it, the more I realize how perfect it is! Can I order today? Can I, can I?!! Love the fence scenes and the cute dogs! Uh oh! It’s only day two of this release and I already see so many wonderful things that I really don’t have. This could be trouble! Today’s seek peeks are really cute! So glad to see Keeway on the line-up today! The new A2 dies have been in demand for quite sometime so thanks, Betsy, for coming through with them. So much inspiration by the DT again today, and I think I deserve the GC because tomorrow is my birthday! Love the Spring Fence set! Beautiful samples from the design team! So much to love! Simply Stitched, the Shape Shifter, the puppies! Those puppies are so cute! Love the cards the design team have done today! What great ideas! Love the simply stitched – can see using it on almost all my projects. Great projects today! Love the puppies and the fence with the flowers. Love all the happy projects today! Those puppies are too cute! Fence Line looks like fun and the pups are just precious! 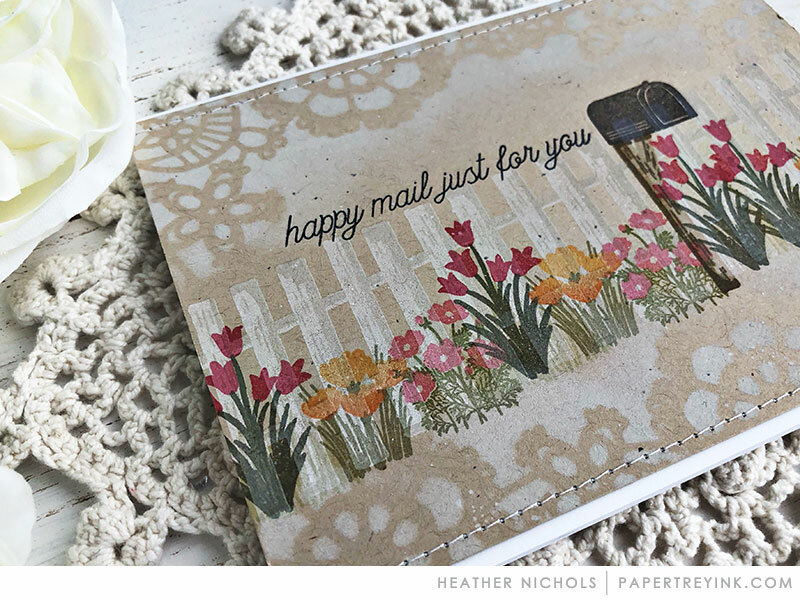 Heather, I love your gift for making great designs on kraft, and today’s sample is really beautiful! The fence line looks really versatile, and aren’t those pups the cutest? I love the sentiments I’m seeing. Oh my!!! The new Paws and Kisses products look super adorable!!! And I love the DT’s sample projects! So cute! Can’t wait to see the full reveal! The dogs are so adorable & I’m not really a dog person but I know my son would love to have these when he’s stamping with me. Paws and Kisses is too cute! Love the combination of Fence Line with In the Woods cover plate. What cute dogs! And I love the fence set – so pretty! I LOVE the A2 stitched dies! The pups are very cute! Great DT inspiration as always. Love all the products you introduced today! They make the most adorable cards. Can hardly wait to see what you introduce tomorrow! Love the new fence line set! Cute little puppies, too! Great projects! The fence line set is so awesome! So many cute ideas and the design team just did a fabulous job on all the cards! The fence and flower cards are really cute! So many wonderful new products! I am definitely getting the new Noted die and the Shape Shifters square 1 die. The puppy stamp set and the fence set are on my list too! Love the cards today! Paws and Kisses is so adorable, can’t wait to see it, and get it! Ooh, Fence Line looks like it will be a fantastic series. I bet it would be a great accessory to the Garden Gate kit. Sweet! Everything is so cute including the cards! Loving the new square shape shifter die! Loving the fence and mailbox!! Those puppies are so cute!! Both of today’s releases are very sweet! I am very happy to see the new A-2 Noted dies as I have been hoping for such a set. 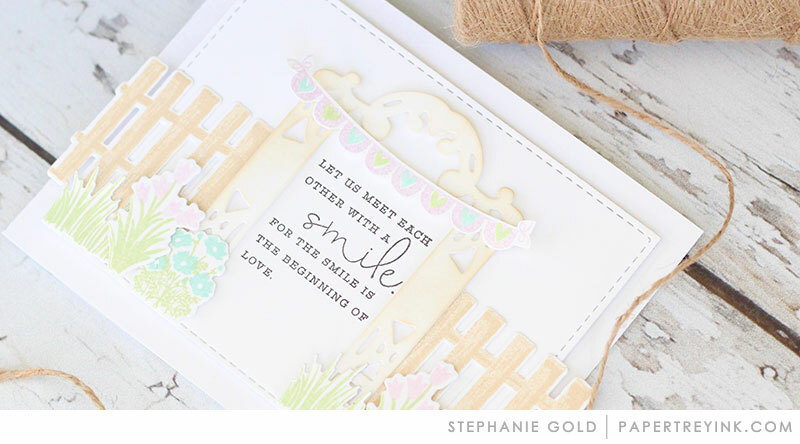 Also, the Fence Line Spring stamp set and dies are singing out to me. I love today’s products! The dogs are adorable and the spring-themed projects are beautiful. Super cute dogs! Great projects, thank you for inspiration! Oh I must have that dog stamp, I so need that dog stamp, I really really do! The picket fence set is really cute and unique, and I have a special fondness for dog stamps! Those little doggies are adorable! Loving both sets from today’s post! I love the look of the Stitched Dies! The new Noted dies look so useful! It sounds like the Fence Line is going to be a new seasonal series—I’m exited to see what else Betsy designs for the other seasons. Fence Line: Spring looks like it could be a fun new series beginning! Love the little flowers. Living on a farm, surrounded by fence lines, you better believe this new Fence Line:Spring set put a smile on my face! Great job showcasing all the new items design team! The doggies are perfect for me right now! My great-nephew has 2 miniature dachshunds that are his best friends…he’ll love the cards. wonderful inspiration from the team. I love how the team used the fence stamp and die. 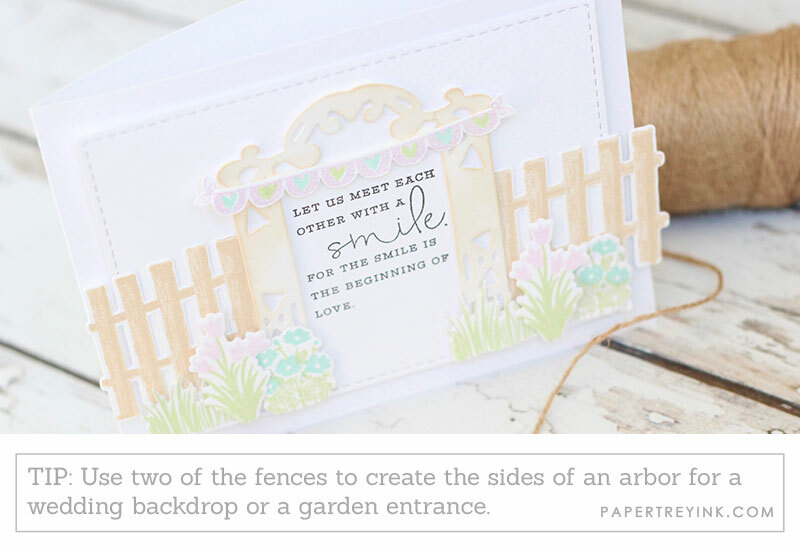 Fence Line: Spring is so cute and so many possibilities…love that mailbox. Lots of great inspiration from the DT today! My daughter is campaigning for a dog so imagine my surprise to see puppies pop up in paper crafts today. Maybe she will be happy with some cute cards instead. The dog stamps just melt your heart! So cute! I love Paws & Kisses. So cute!! Aw, love the doggies. And more stitched dies to love! Awww…the doggy der stole my heart already! Too cute ❤️! Love the fence dies and images as well! Love the noted simply stitched. something so “simple” can add that extra touch a project needs! love, love, love the new new Noted dies. the rest is just icing on the cake. very sweet day indeed! I cant wait to start making new dog lover cards! How exciting! Totally loving Paws & Kisses! I love it all—the dogs, the paw prints, the fence, the mailbox, the boots…Oh, I like it! Heather’s critters are always adorable and these sweet pups are no exception! Love the dog set and I really like the fence with the flowers too. Geodes are fun also. I have one that we found and cracked open but it is just pretty clear with a little gray tone – not pretty but at least it was one I found! Loving the stitched stuff also. I am going to have to get a job to support my hobbies. Love the fence collection and the bunches of flowers! The dogs are super cute–hope you do a cat set too! 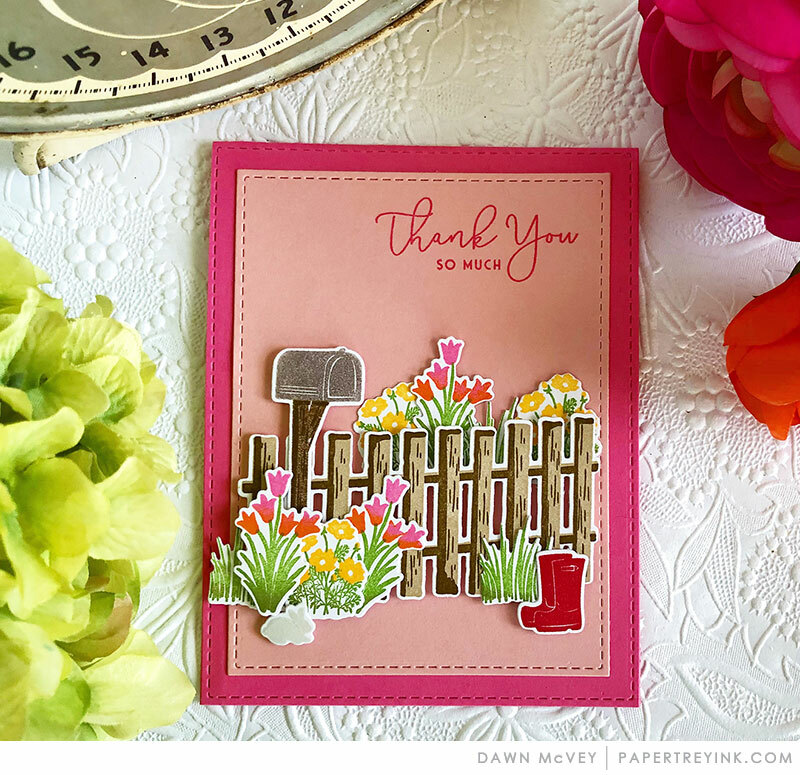 Fence Line Spring is adorable–love the boots and mailbox! Having a cat doesn’t stop me from loving dogs! These are so cute, I have to get them. Awww!!! The pups are just adorable! And the fence line is so pretty and unique! The pups are really cute! OMG doggies! I can’t wait until Sunday night!! The fence stamp set is great.The shading is so dimensional.Love it! You had me at Paws! Love the new dog collection, and Betsy’s new stamps are perfect as always. Great detail on the fence stamp and have to say the dog stamps are just so cute! SQUEAL!! I LOVE LOVE LOVE the New Release Products and the AMAZING Inspiration!! THANKS for sharing and have a FABULOUS Week!! What cute spring scenes Betsy’s new set makes! I love the dog set too, especially the sweet sentiments. Awww, cute puppies & gardens & gates – it’s all so lovely. Great projects for on the team as usual. Love the new dog themed sets! Oh! Fence Line – very cute! And Spring in the name indicates more goodness for coming seasons – that’s awesome! The new Paws set is truly darling and will be perfect for dog lovers’ cards. Oh my gosh! Today’s my day! Puppies and a beautiful garden complete with a fence and everything else you need including a bunny! OMG…ok these are it! love the fences , flowers, stitching, doggies…oh I am in! 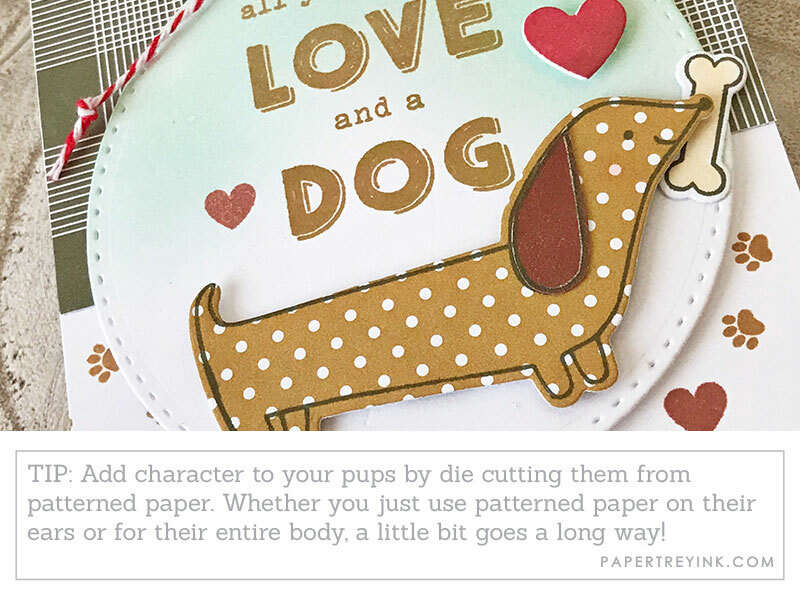 The paper-pieced puppers are just adorable! What a cute set! 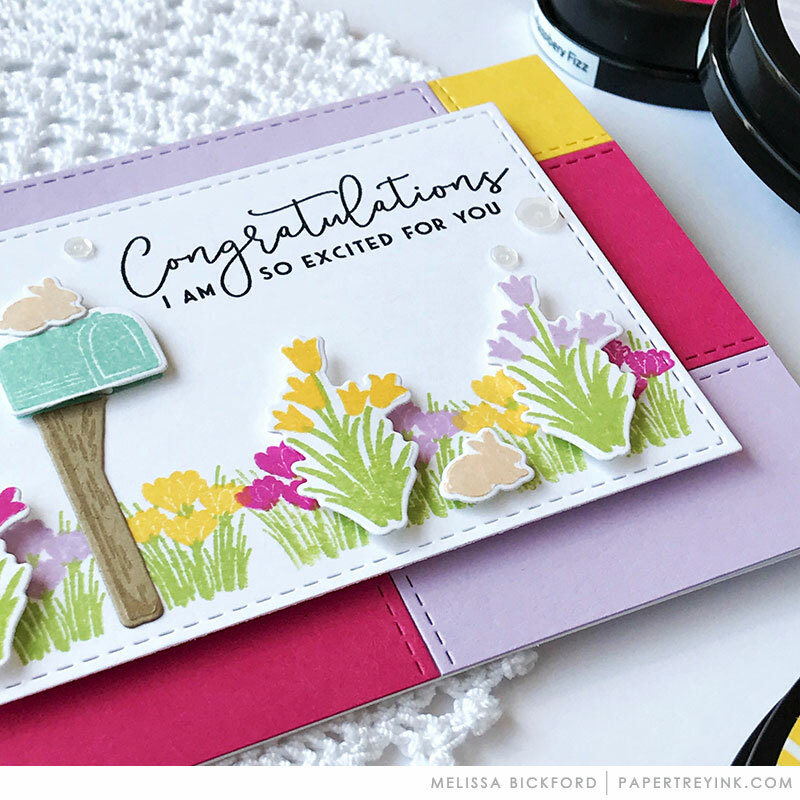 I’m loving all the fresh spring cards made with the fab fence stamps and dies! Those puppies are so cute!!! And, Betsy, I like the fence too! That’s the best looking fence EVER!! A Must Have, for sure! Wondering if paws and kisses has kitties, too…. >^.^< ? Those puppies are too cute!! I love the fence, Betsy! From the name and description, one can infer that Fence Line is a seasonal series. That really excites me because the spring set is charming and I want to see more. Love the fur babies – so cute! And the fence – just adds to my bitty floral collection! The doggies are too cute; they make me smile!!! Betsy always weaves magic into her stamp sets. Oh Paws and Kisses is adorable! Perfect for cards for all my friends with fur babies!! 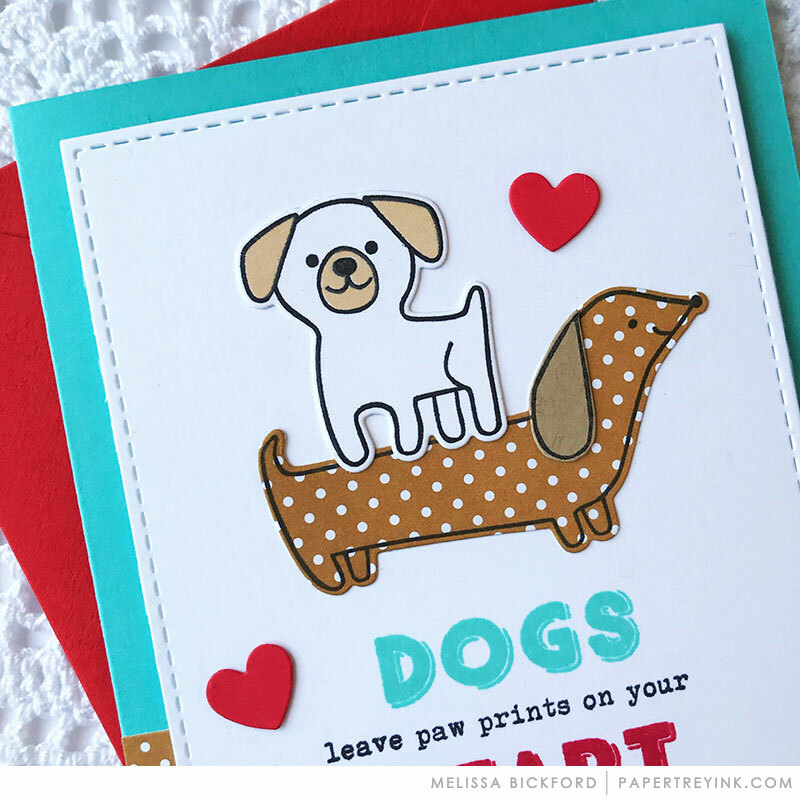 The two dogs in Paws and Kisses are just adorable, I love how Melissa added so much texture with patterns! Such cute, cute items today. Heather, I really like your pets and everyone’s samples today are wonderful. Lots of interesting tips. I look forward to getting the stitched rectangle dies to go along with my A2 existing dies… Thanks PTI! The fence is really cute but the dogs are adorable! Today I like the stitched noted die set. Love the fence stamps & dies that Betsy created. So many possibilities. The A2 stitched rectangle is also on my wish list. Love the release. The sentiments are to die for and I so need the dog set. WOW…so many cute stamps…the fence, the adorable puppies, the darling sentiments (I especially love “you wag my tail”! I really love those bunches of flowers in the grass, too! My “must have” list is growing! Thanks for all the fantastic cards…great creative inspiration!! Paws and Kisses is too adorable! Betsy’s new stamps and dies are the Best! Love the adorable new puppy set! I love the fence series! The spring one is great but I can’t wait to see summer. I hope there is a beach fence with sea grass and shells for that one. The pups are adorable. My mom loves dogs so this would be a great set to use for cards for her! Ok, so I am a huge animal fan and the paws & kisses is absolutely adorable. And, I’m always up for good fence-it is just the right addition for certain layouts. As always, the design team does not disappoint. Awesome projects! The doggie set is so cute! I love the pretty fence and all the sweet images. What a great scene set! Love the shading on the boards! 🙂 Super cute dog loves images. Fun day. Love the dies and the Fence Line set. The mailbox and the rubber boots are a sweet addition. Oh my, what cute little doggies!!! Love the puppy dogs–so cute!!! I love Betsy’s new set Fence Line: Spring. I’m guessing this will be a basic set that can be built on as we go thru the seasons. Love that picket fence from Betsy! And Those sweet little pups are adorable! Love seeing the new release stuff. Always a highlight of the month for me. How cute are those little doggies!!!!!!! Those doggies are absolutely adorable! Love all of the sample cards too! What cute projects! And super interested in the stitched dies…the design team always knocks it out of the park. The fence set looks fabulous!! And those puppies are so cute! The Noted: Simply Stitched A2 Vertical is adorable. I love the spring and dog themed projects and new stamp sets! I wasn’t expecting PTI to release the Noted: Simply Noted A2 Vertical dies so soon after customers had started asking for it in the forum. But it is the item I am definitely most excited about this month. I wasn’t sure I was going to place an order this month, but these dies have changed my mind. They will be the first thing I put in my cart. Love that there are so many sizes in the collection. Also, I really appreciate that Heather has designed a budget-friendly $5 set with another cute dog. I’m loving the fence set with the flowers and postbox. And I can’t resist a dog! The smile on the dachshund puppy brings me so much joy every time I look at him. Amazing the joy a perfectly placed line can evoke! That puppy is sooooo cute!!!! Although I’m not a dog owner, the projects featuring the pups are so precious. The Fence Line set give the cards such a realistic feel. Great work from your design team. Love today’s products! The doggies are adorable…can’t wait! Love the dogs! Looking forward to the release. Love me some puppy love; dawg! Those dogs are too cute, especially the dachsund! The new fence lines are fun additions to any scene! The Fence Line set is so pretty. Oh my gosh! Those dogs are adorable and such great sentiments to boot. Polka dot puppies! I must “adopt” one! These are just so sweet….love those sweet puppies. The dogs are so cute! Thanks for the inspiration. I’m a crazy dog lover and never can have enough of those. Love the fence set. Wonderful projects! I’m loving the flowers that go with the spring fence. They are so happy that they make me smile! The fence and dogs are both great! Fabulous projects all around. Sweet creation by all! Can’t wait! Love the detail on the fence! 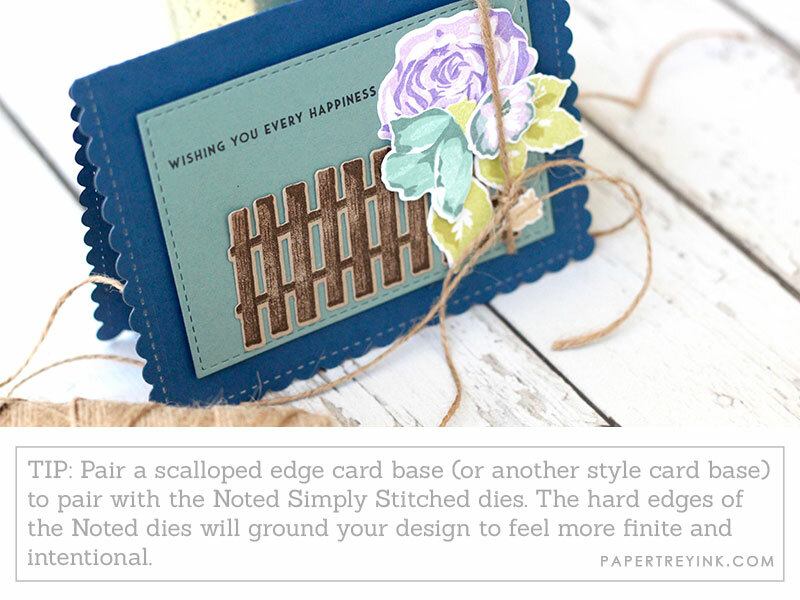 And can’t wait to get my hands on the Noted: Simply Stitched A2 Vertical dies! Such great new products! LOVE the doggies. I make cards with dogs and cats on them and donate them to a local animal rescue so they can sell them as a fundraiser so I’m always on the lookout for great dog and cat stamps. These are unique and different than anything I’ve got. Thank you for the chance to win! Love all the new items listed here today. You are going to make it very difficult to keep within my budget! Good thing Friday is payday! Spring can’t come fast enough here! We’re still under a blanket of snow, and a few more light snowfalls to come. Here’s to looking forward to May’s warmer temperatures and staying busy crafting with Spring goodies like the lovely Fence Line stamps! Love that cute little dachshund! and cards are all wonderful. Love those fences and flowers! I love the Fence Line: Spring! The cards are really cute and fun! These dog stamps are adorable. And I love the stitched rectangles! Those little pups are just too darn cute!!! The design team projects are fabulous! All the stunning cards today are making me want it all. Thank you design team for bringing sunshine and smiles to my day. In the midst of snow and cold and life challenges, your beautiful work shines through it all. How does that saying go? Can’t have too many dogs or too many doggie stamps! These new supplies are super cute and fun! Loving the fantastic design team samples. I like the spring fences; they look so cheerful! And the puppies are adorable!! Fun dog stamps! Can’t wait to see the full set! love the new dog stamps. Great work team. These new puppies are so adorable! I am also very excited to see the new Betsy Veldman fence line. The dog set is adorable, and the fence a very welcome addition, because it will work with so many sets. Thank you! Oh, the puppies are so adorable! I love the tiny paw print, too! The cards today with Spring Fence Line are so pretty! So many fun products today! I think the cute puppies are my favorite. The Stitched Noted dies would be super useful! Cute puppies! Can’t wait to see the whole set! 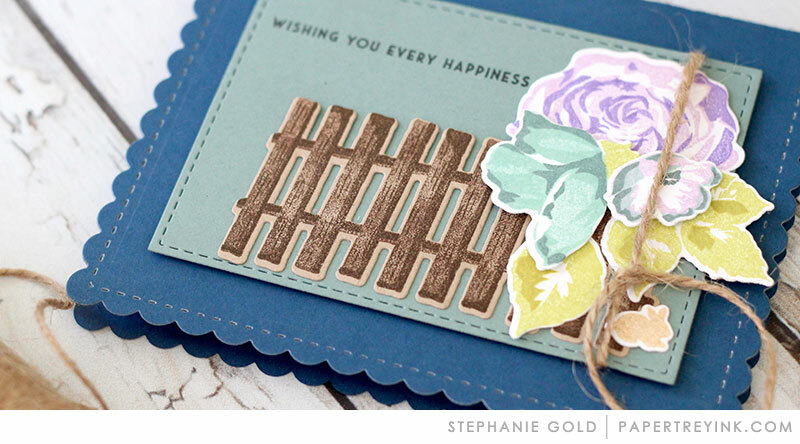 Love the versatility of the new Fence stamp and die set. Wow, love everything so far. Wonderful inspiration from the team today! 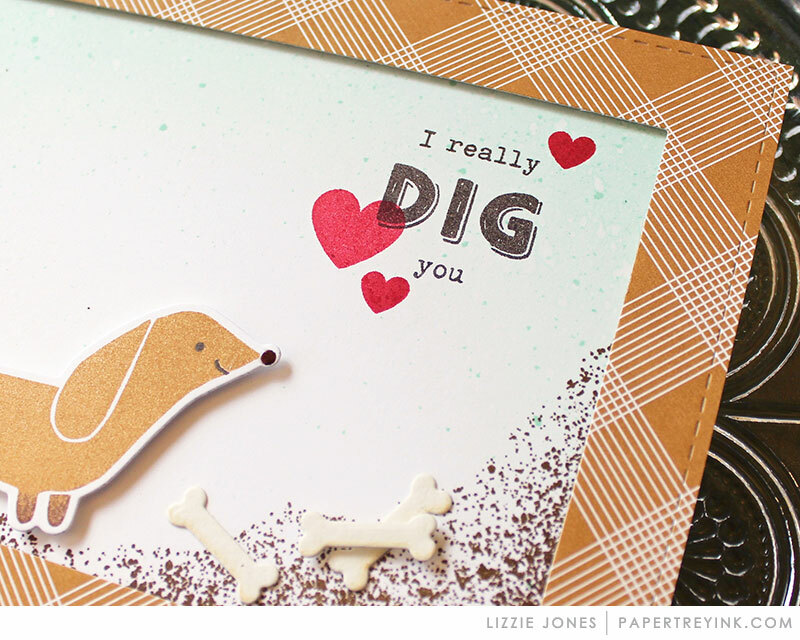 Really cute puppies and I love all the cards the design team created with them. Wow, gorgeous new products today. Loving all of them. Oh! I love the fence and extras that go with it. I also think yesterday’s rock ideas are fabulous! Betsy’s spring fence is fabulous. Who can resist cute dogs?! I love the springtime fence! So so pretty. I always love Betsy’s flowers. I love those puppies. Definitely they will be in my basket this month! Puppies!!!!! And some spring time!!! The fence is beautiful! I love it with all the flowers! Love the new stitched dies!!!! Who wouldn’t love to build a scene with a white picket fence and bunnies??? Paws and Kisses is so cute. I love all of the cards today. Love these beautiful garden scenes and the adorable pups! Fabulous samples today! Love the fence and flower set. It would be fun to use the dogs with it! Love the country like scenes with the fence, flowers and mailbox. And the sentiments with the doggies are great! Dig the dogs and Betsy never disappoints. 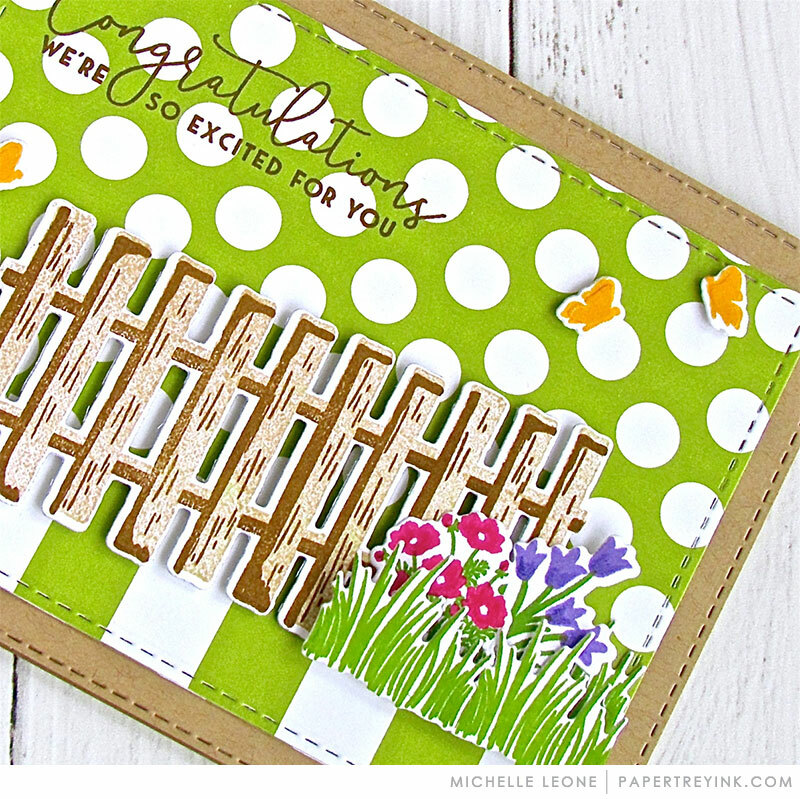 I LOVE, LOVE, LOVE (did I say Love) the fence line spring set of stamps! I love those dogs! They are so cute! Fabulous samples today! Such adorable dogs! How can you not love them?! Great inspiration today, love the cards. I love dogs and fence line has given me tons of ideas! I can’t wait to see the full release. I love the puppy set! We got a rescue dog last year and I need this!!!!! Puppy dogs? I hope that means we will see kitty cats soon too! These are too cute. “All you need is love and a dog” – So true! Hoping for new kitty stamps soon too! Doggies!!! Man, is this set cute or what? Loving Fence Line also, I really enjoy creating little scenes…hoping this will be a four season series! 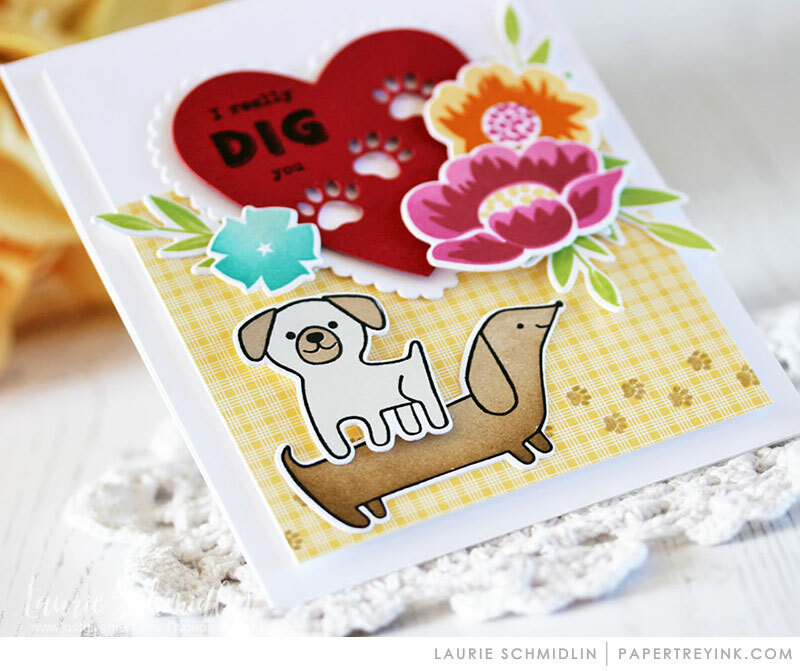 I love the adorable dogs and see so many possibilities with the split fence stamps and dies. Great release!